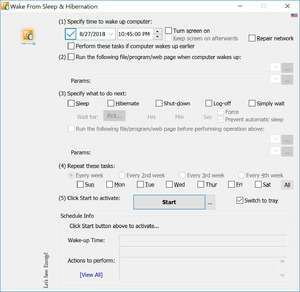 When your computer is in sleep mode or hibernate, you're generally able to save energy and prevent wear of your components but automating the task of waking up can be a task. With WakeupOnStandby, you can wake up your system from hibernate or sleep at the time and date that you specify. When the time comes that you set, your computer should wake up automatically. WakeupOnStandby is also useful in that you can also execute commands such as other programs after the system is on again. Version 1.7.20.6 is a freeware program which does not have restrictions and it's free so it doesn't cost anything. For security reasons, you should also check out the WakeupOnStandBy download at LO4D.com which includes virus and malware tests. Additional screenshots of this application download may be available, too.